I generated a lot of respect for Subrto Bagchi, when I read High performance Entrepreneur as a writer in the realm of business and management. My respect for him increased manifolds after reading his story in Go, Kiss The World. Finally when I finished reading The Professional by him, he joined the place up there with the people I idolize, I aspire one day I can be in the same league as them. All this not because of what he has achieved, but the way he has achieved, it is more about the journey and the destination. I would concentrate on “The Professional” here, the book is the percepts of how to be a perfect working professional. It is what, if I may call a bible for all working professionals people who would like to be professional in their conduct. 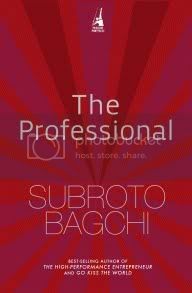 Subroto Bagchi, has painstakingly illustrated the behavior, conduct and ethics of a professional. In this world of falling moralities and flimsy loyalties, with likes of Satyam and Lehman rising from the dust and ending there itself, the conduct of a professional can be a grey area. What Bagchi illustrates is the mastering the art of being correct in spirit, not only in legalities. He writes the prescription for a strong and a moral work ethic still providing flexibilities to change organizations and switch loyalty. The examples he has quoted are relevant, inspiring and real life, motivating the professional on how he can follow the ethics and still be successful. Though I am not sure how mature, the recruitment teams and the HR in the organizations are to value the kind of attitude Bagchi proposes in a professional. More difficult would be judging the professionals who actually live the attitude than mere glib who would try and speak their way to glory without actions. Bagchi, presents a correct and moral world pictures and also claims about the lengths he has gone to make sure these traits are identified and rewarded in his organization, but I have sincere doubts that these kind of model conduct would practically work in Non-Export areas, like government contractors, Builders, and many more agencies which thrive around the corruption in the government. But still nevertheless, I would say it’s a brilliant book and a must read for all professionals. I would recommend it as a must read especially for the students of professional courses too, to understand the value and relevance of the perfect code of conduct for a professional. 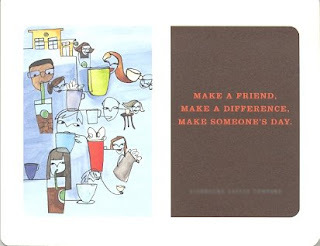 Summary: A great read, very easy and free flowing in the content and message. Relevant, inspiring and still a light read. A must read for everyone. I was reading the post by Smita on her escapades which she attained by sleeping her way to glory. Generally I am not the kind of person who would sleep during the day, but then some days are just not normal. This incident happened on one of those kind of days and till date it has been one of the most embarrassing moments in my life. To give a little background we had a closed knitted team in the office, all of us bachelors and around the same age group with a difference of 1 or 2 years. Since I had recently moved to Hyderabad for the project I did not had any other friends in office so I generally used to hang out with the team folks joking around having fun. On the project side I was leading the team and I had made good rapport with the people reporting to me. My boss was based out of Bangalore so I was the one who was solely responsible for the day to day activities of the team. So one of those days I had an awesome weekends when we did all the masti and fun watching night shows, having midnight buffets, driving on necklace road and sitting across Hussain Sagar lake only to return back home at 4:30 in the morning. On Monday we had a Vedio Conferencing scheduled at 8:00 in the morning with the client. So essentially the sleep deprived me somehow surviving on my coffee went through the meeting. Finally I sat down at my desk and started working on something, and I don’t know when I slipped off into the oblivion of deep sleep with my face on my palm cup and my elbow resting on the table. I don’t even know how long it was before I heard something. It took me 5 seconds to realize where I was and what was happening. Coming back to senses I see the most dreaded scene, my whole team was standing around my cubicle giggling and laughing. That was so embarrassing, I was supposed to be the one to set examples and I was the one who was to act like boss and here I was acting like a sleeping beauty in front of almost everyone who reports to me. I just felt like “Yeh Dharti fat jaye aur main isme sama jaaon” and not to mention that this was the first assignment where I got to be the boss. I finally gave them flimsy explanation which on retrospect was all the more idiotic because I did not owe an explanation to them 🙁 and then proceeded towards the loo. One look at the mirror my face had imprints of my own fingers which looked like I have been slapped tightly by some girl trying to score with her, the clothes had been crumpled and disoriented like I had chosen Recession hit Investment banker as my adult Halloween costume theme. Can you believe it I am writing this blog post again at 1:30 in the night when I have a conference call in office tomorrow at 8 in the morning. Damn I don’t get it, Do I? 3- The internet- this is a major irritant at my work place. I really hate websense. I am thinking that I should call a meeting of all the people who have been tortured by this F**KING morons sitting in San Diego, lets contribute buy the shares of the company and simply close it down. This would be one gift from us to the entire humanity. Some inventions shouldn’t have been done this damn software is one of them. Well you can read abt this nuisance in my office here as well. 4- Car Parking & Campus – We have a multilevel car parking of 10 Floors with a capacity exceeding 2000 cars. Now this parking is actually built in the corner and any workplace building is around 1 Km from it at least that too uphill while coming back. My one question why, Why this idiotic car place right in the center? Why you expect us to slog our backsides off and then actually fight an uphill battle on feet or cycles to reach our car and then drive 15-40 Kms to reach home. No when you recruited us, we never pledged our life to you. 5- Security- Now this is the latest Icing in the cake, they have reduced a lot many number of guards may be with an idea to cut costs. So essentially what happened today was there was a 2 Kms long line of cars while the remaining guards were struggling to check every care to let it in. Generally there are 15 guards passing around 12 cars at one time. Now this has been reduced to 7 which actually resulted in a huge waiting and I actually waited for 45 minutes to actually get to the Car Park and then another 15 mins to walk to my building. I hope this damn recession ends and some sanity is restored in the work place. Otherwise one of my most admired corporations would turn into a hell hole which people would despise and loath. Most of you would have been following or randomly reading Dilbert and enjoying his misery at office. A lot of sadists like Dilbert because it gives them a sadistic feeling there is someone who is in the worse state than they are. I know when you look at someone something, who is not in a good condition as you are, you feel better. I have been doing this since n number of years under observed parental guidance when the usual conversation was initiated by mom in the following fashion “Yeh report card hai tumhara. Yeh number aaye hai, isse kuch hota hai aajkal, isko to bas padhao mat computer pe bitha do, vedio game khilwa lo bas padhai mat karwao. Dekho pados wale Mishra ji ke bête ko har saal first aata hai….” The last line used to be my moment of truth when I would get a line of self defense “Abhi Mishra uncle ke bête ko kyon Sharma uncle ke bête ko bhi dekho who to Doosri baar bhi fail ho gaya, Main kam se kam paas to hua (Large Grin on the face)” and this generally used to end up with a huge lecture from my mom that would have been nominated for Best Mother in Speech giving role in Oscars had the movie bach le India been casted properly. 3- Now the boss, here is where Dilbert gets really lucky he has one boss the pointed hair one who is a jackass. I am into something which is called as Reporting Structure and which we have for our extra pleasure defined as “Dotted”, pun intended. Now when it comes to assigning work I have four bosses who all in independent capacities of each other can can assign me a full load of work. All this seems trivial when I have a 5th boss who decides how well I have done my work independent of all other four gentleman. His favorite online signature being “How would I know”, yeah of course how would anyone else in the word know? Laugh Mr. Dilbert laugh to your fullest on the misery of this corporate weasel. 4- Now, the method of insults Dilbert is offended by offering him no hikes. But at least he can still feel good about the status quo. I wish life would have been so rosy with a rosy for yours truly. But as man proposes and god disposes, yours truly got a hike a tiny winy one though but optimistic me tries to attain a bliss which is shattered at the next moment identifying the hike was nothing but to equate the pay with the fresh recruits. This is what is called torture and insult Mr. Dilbert, I am sure what would you know of it. 5- The best part about Dilbert’s job which makes me jealous of him is of all things he knows what he is doing and if the project is going to fail or not. But me, the poor me toils hard and toils still harder just to find out the requirement has changed and nothing is freezed as is. I mean I cannot write specs for a nuclear bomb to be made out of used radiator valves, you would not get it Mr. Dilbert do you mind writing all those bloody specs here while I feature myself in the cartoon, for a change what say? This post might sound like ranting but to me it seems what is actually bothering my thoughts since a long time. I seriously believe that a conversation could only lead to a thing like which happens so often in such renounced company. Setting: The HR Guy, The Network Guy, The Employee in a deep discussion. HR: I have joined this organization such a long time ago. I need something to show that I am useful or they will all know that I am just passing time. NW: Ditto my case is still worse. At least employees are afraid of you. If they come to no I have no work I will be the first one packing my bags. Emp: But why you are supposed to be pillars of organization. Why do we need to be afraid of you. HR & NW: Shut Up!!!! You don’t know anything about organizations. HR: We need to come up with some plan with which we can fake usefulness in the company. Emp: But Why you need to fake you can actually work to increase the Productivity………. HR: Productivity that is it. That’s what I will be doing. NW: We can block things it would hypothetically show that we have enhanced productivity. HR: Sounds good not much effort eh is it ???? NW (Excitedly): No just a little tweak in the firewall. HR: All other Chat clients. Emp: What is the logic for doing it? HR: Logic what is that? Emp: But it won’t increase the productivity will it. HR: I don’t want to increase it. I just want to show that I am doing it. Anyways they can’t measure it. HR: Can’t we block the public email sites. The F***ing B*****Ds post resumes through them and also can we block job sites. NW: Job sites is easy. Emp: NO You can’t block Public Email Sites. NW: But why you want to block it. HR: If they won’t post resume it would reduce the attrition numbers in my tenure. At the end of the day numbers are all that matters. Emp: You will never be able to do it. You can never justify it. NW: Eureka!!! I can do it. Security issue, Enhanced security for the clients. Employees can transfer code and data through public email. Emp: But no one does it, you know it. They don’t even bother about it where there are products being coded for millions of dollar like MS & Google. I have completed one year in the system. The most interesting question in front of me right now is should I mourn or celebrate. What drives me to work early on Monday Mornings? Awesome work that lies ahead or the parking space on the lower floor in the car park. There are million questions in my mind of similar nature. I know I am totally confused but if anyone of you could provide answers to this poor soul. Answers Anyone???? 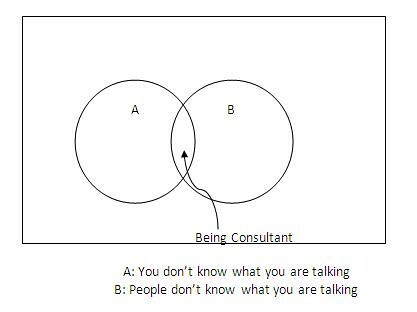 I always wondered about the actual disconnect which happens between the team working together like mine in a consultancy world. A lot of people I interact with, discuss things and together we work as a part of team. I have never met most of them personally for us the existence of each other is confined to a voice on the phone and the emails. 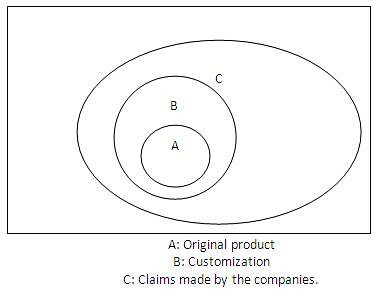 The disconnect is further when it comes to the client whom the interaction is limited and very formal. The major challenge is how to get in sync with people. How to actually say how appreciative we are of each other and how we enjoy the discussions and perspectives arising for them. Amidst the lot of interaction which happens between us it is very difficult to convey the feelings of value of a team member. Often in the FMCG scenario it is done through parties outings. I was amazed by a way my client found out a way to say that how he valued out efforts. 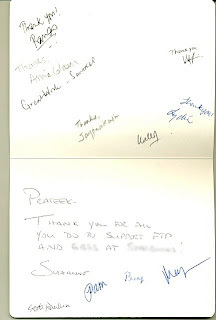 Me & few others from our project got this personalized note from director from the client side and signed by other stakeholders from the client and my company. It was something like this. It really made me feel that I was a part of the project and a huge team. Just wanted to thank everyone in the team for this. Yes, if you thought money lenders were a rarely found species and is only found in rural interiors then you were wrong. The cheat poor farmers, by charging them interest rates as high as 50% per annum then you are again wrong. I, simple supply chain consultant was duped by my financer to pay an interest at a simplistic rates of 586.1064% per annum, yes I am not joking. If you think it is funny then its not and yes I never cheated in any of my exams; I am not an illiterate but just missed the fine print you know. As my mom always complains that I don’t listen to elders; seems quite true in this case. When I completely misunderstood the ad for the State Bank of India, which said it aloud umpteen number of times through out the day “Only Banking and Nothing else” I didn’t got the hidden warning that I should not use any other Financial Product from SBI except banking and yes I became a proud owner of a Gold Credit Card of SBI. A genuine customer who always paid his bills on time; and in comes the creepy money lender worried about how he will earn if the bills are all cleared in time. This time he decided to roll his sinister plans against this bachelor guy in Hyderabad. The guy always had the habit of paying the bills in the 1000s the pattern was being observed by the money lender. He used to pay 7000 when the bill was 6600, used to pay 12000 when the bill was 11200. This time he paid a mere 15,000 of his bill of 15,643.46 and the eyes of the shylock oops the money lender shone with greed and he appropriately charged an interest of 314.28 from the guy. Yes the money lender was SBI Credit Cards, one firm which I had immense trust on because of their banking history in my family. And the guy was me who had to pay an interest of Rs. 314.28 per month on and outstanding sum of Rs. 643.36. And yes they never forgot to charge the Rs. 38.85 of taxes to the government. Eventually I paid up an interest at the whooping rates of 586.1064% per annum. Yes I got my credit card closed immediately and vowed that I would never do any business with SBI cards people. For all those who are applying for the credit cards from SBI, they have a policy that in case of a part payment the interest is charged on the complete bill amount instead of the amount due. So for example if on bill of Rs. 1,00,010 you pay Rs. 1,00,000 and Rs 10 are remaining as a balance. Then at the gold card interest rates they will charge you an interest of something over Rs. 2000 over the due Rs. 10. That might just amount to an interest rates of 2,41,082.2% annum. I am sure there isn’t a profitable business in the world than this new age money lending.